Gosari namul is a traditional Korean side dish made with edible fern known as fernbrake or bracken fiddleheads. 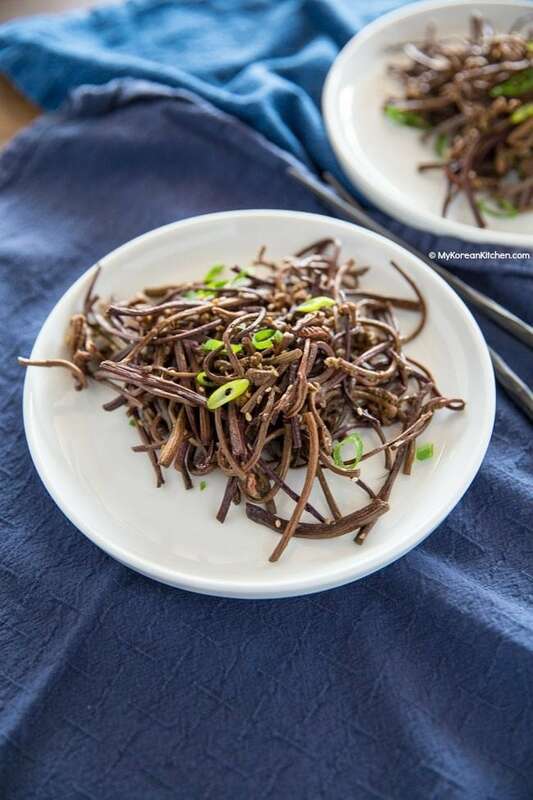 It is seasoned with soy sauce and minced garlic among other things and has a meaty texture. 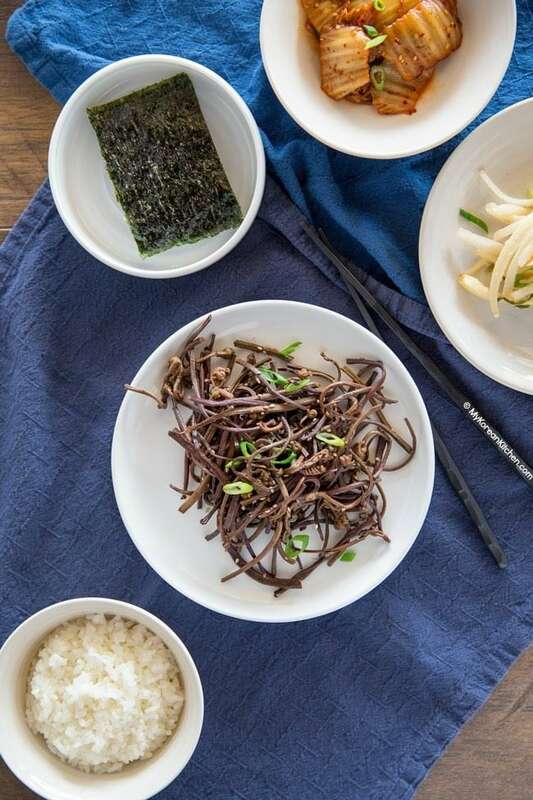 It is commonly served in a traditional bibimbap! 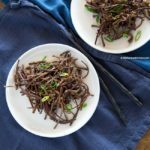 Today I’m sharing a Korean traditional side dish, Gosari Namul (고사리 나물, Seasoned Fernbrake Side Dish) recipe. 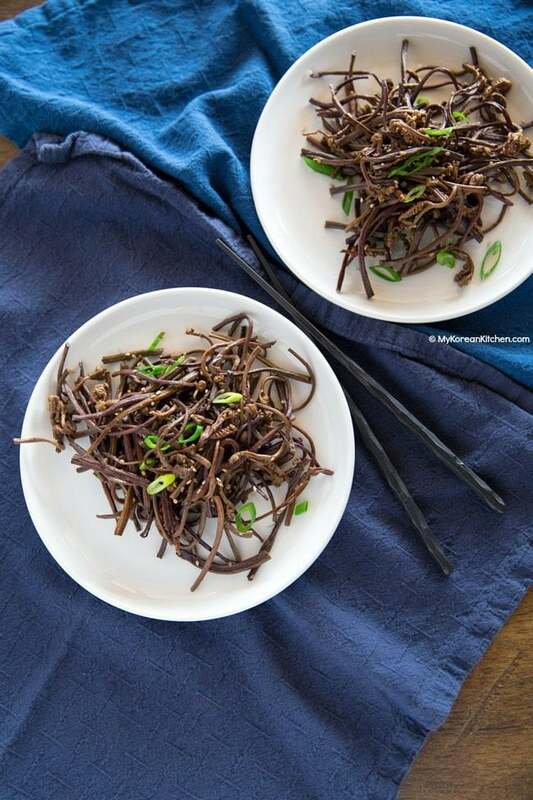 FYI, I shared Doraji Namul (Sautéed bellflower root) recipe last week. These two namul are often served together at an ancestral memorial service table (charyesang) and also in bibimbap. You can read more about them from here. Gosari / Kosari (고사리) is young stem of fernbrake (or fiddlehead). 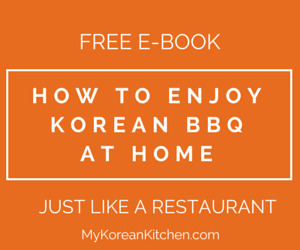 It is commonly used to make a side dish or in soup / stew in Korean cooking. 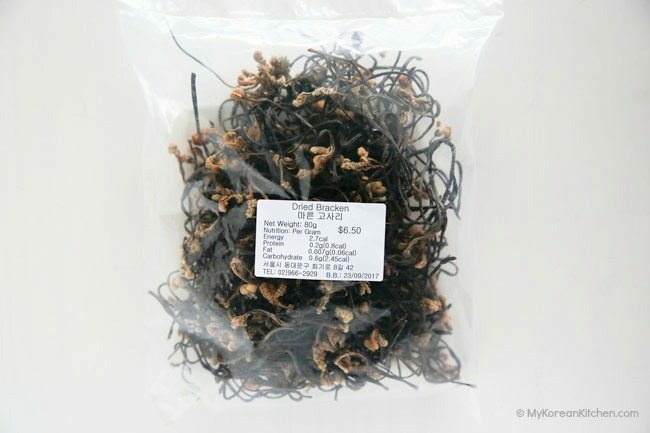 You can get dried fernbrake or (already boiled) ready to use fernbrake from a Korean grocery store. Though it is much easier to find dried ones, as ready to use is not always available. The above dried gosari package weighs 80 g / 2.8 ounces and I normally hydrate them all in one go even though my recipe below is made with about half of the hydrated gosari. For the part that I do not use straight away, I simply put them in a plastic bag and freeze them after boiling and cooling it down. You can use the remainder to make more gosari namul later or use it in soup or stew. I don’t know what raw or ready to use gosari taste like as I’ve only tried it in a finished form such as today’s recipe – Gosari Namul. Among other things, Gorasi namul is seasoned with soy sauce, minced garlic, sesame oil and sesame seeds. So it has a mildly garlicky and salty taste. Also, you should expect a strong nutty aroma coming from sesame oil and sesame seeds. They quickly overtake the fernbrake, in a good way. It smells and tastes warm and earthy. On a side note, there is some controversy whether it is even safe to eat gosari / fernbrake / fiddleheads or not. This is outrageous! I’ve been eating this all my life (30+ years) and only just discovered the potential danger. Lol. Anyway, if you’re interested, you can read about it from here. 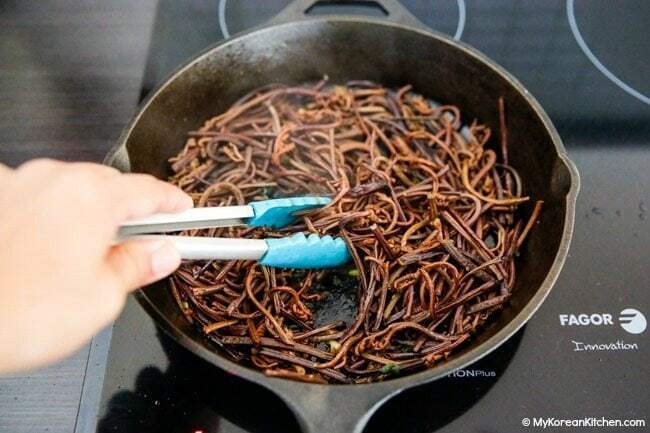 But, I think the Korean way of preparing and cooking the fernbrake makes it safe to eat. (This is not a medical or health advice. Seek your professional advisor’s opinion if you’re too concerned.) Enjoy! 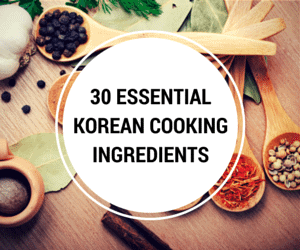 **If you want to learn more about Korean ingredients, check my 30 essential Korean ingredients list! 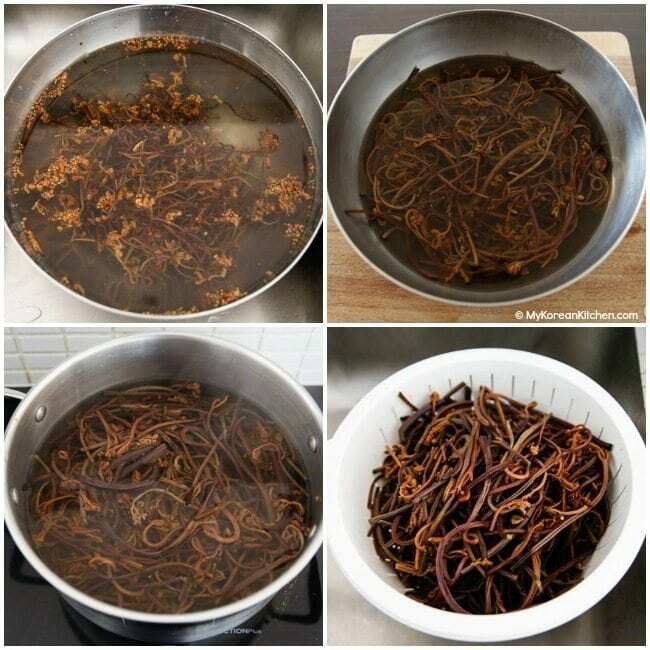 1.Place the dried gosari / fernbrake in a large bowl and immerse in water overnight (8 to 12 hours). Drain away the water. Boil some water in a sauce pan (enough to cover the fernbrake) and add the fernbrake in rolling boiling water then boil further 10 minutes. Drain away the water and rinse the gosari under cold running water. 2. Comb through the fernbrake and cut any hard woody bits from the stem. (This is a bit of a fiddly and time consuming process but is totally worth it!) Line them up and cut into index finger lengths. Transfer them into a mixing bowl. Add the seasoning sauce and mix them well. 3. Heat up a skillet over medium high heat. Once heated, spread the cooking oil. Add the seasoned fernbrake and stir around for a few minutes. Add the water (3 Tbsp) and simmer it over low heat for a further 3 minutes. Garnish with the sesame seeds. Remove from the heat. Serve. 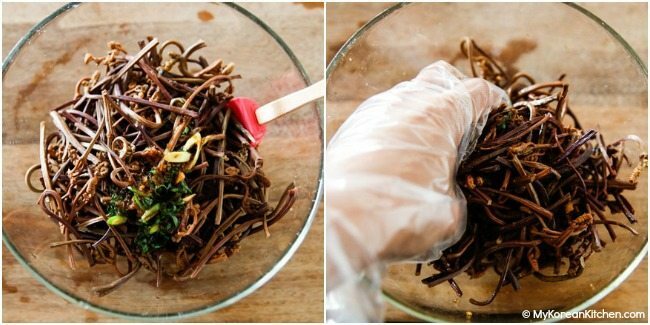 Place the dried gosari / fernbrake in a large bowl and immerse in water overnight (8 to 12 hours). Drain away the water. Boil some water in a sauce pan (enough to cover the fernbrake) and add the fernbrake in rolling boiling water then boil a further 10 minutes. Drain away the water and rinse gosari under cold running water. Comb through the fernbrake and cut any hard woody bits from the stem. (This is a bit of a fiddly and time consuming process but is totally worth it!) Line them up and cut into index finger lengths. Transfer them into a mixing bowl. Add the seasoning sauce and mix them well. Heat up a skillet over medium high heat. Once heated, spread the cooking oil. Add the seasoned fernbrake and stir around for a few minutes. Add the water (3 Tbsp) and simmer it over low heat for a further 3 minutes. Garnish with the sesame seeds. Remove from the heat. Serve. I camp in Alaska with acres of Ostrich Fern Fiddleheads. Since I stay there for over two months, a way to collect and preserve them would keep me in vegetables for the entire season. I’ve heard of people sun drying and reconstituting them into green fiddleheads. Have you heard of a way to do this? I have mesh herb dryers and May is very sunny with little rain. I never thought of drying or eating the stems. Looks like this will be a new experiment for this season. There must be a combination of drying, salt water, blanching, etc. to keep them as green as possible. Any direction would be appreciated. Sue, thank you so much. Bibimbop is one of my favorite dishes and I make it all the time but did not know the name of the fernbrake. 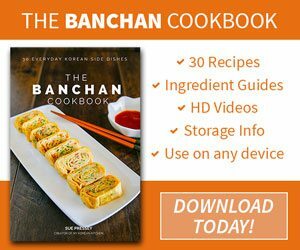 I’m so glad that I will be able to make my bibimbop even more authentic. I’m so glad for all your recipes. Thank you!!! I just love your blog. Thanks for sharing so many wonderfully delicious recipes!! And your explanations and pictures are so useful since I am not always familiar with the ingredients in your recipes. THANK YOU!! My former SIL is Korean & when she came here, as a new bride, she went nuts when she discovered that her house was smack in the middle of a field filled w/fernbreak!! She picked, dried & made this side dish, to my delight. I hunger for this every once & a while. It is so yummy. Thanks for this recipe. You’re welcome! Hope you make it soon.